Super Mario Sound Collection: Happy! Mario 20th Super Mario Bros. [Nintendo DREAM Vol. 139], (or just Happy! 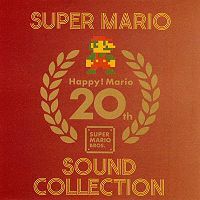 Mario 20th - Super Mario Sound Collection) is a compilation soundtrack including various pieces of music from Super Mario Bros., Super Mario Bros.: The Lost Levels, Super Mario Bros. 3, Super Mario 64, and Super Mario Sunshine. It was released only in Japan to celebrate the 20th anniversary of the Super Mario series. The sound track uses a similar logo to the Super Mario All-Stars Limited Edition. This page was last edited on May 20, 2017, at 22:06.